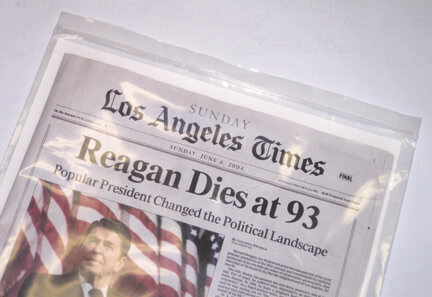 Availability: Easy to use, protects newspapers & projects in storage! Newspaper File Kit 2 pc zaps acids! 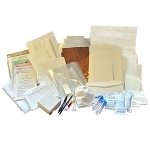 With each kit, you get the clear zip bag 12x15" 4 mil heavy polyethylene, ONE (1) heavy sheet 1 ply of 100% cotton museum-quality AlphaRag Artcare(TM) sheet that features MicroChamber Technology. This paper meets the regulations of ANSI/ NISO Z39.48-1992 (Permanence of Paper) and passes the Photographic Activity Test (P.A.T.). No optical brighteners are used in the manufacturing process. The MicroChamber products incorporated in this heavy paper effectively remove many harmful compounds such as phenols, ethanoic and methanoic acid, sulfur dioxide, ammonia, and formaldehyde, which contribute to the aging of artwork and other materials. This heavy white sheet is Buffered, AcidFree & LigninFree. 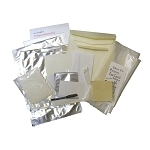 Each kit also includes a Free Newspaper Preservation Booklet and 2 gram silica gel packet. The paper is AcidFree, LigninFree, Buffered to impart a pH protective backing (and does much more than that). The polyethylene zip pouch is thick and moisture-resistant & features a zipper style closure along the smaller end. Each kit includes a small 2-gram silica gel packet for added protection from moisture. 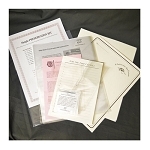 We're also including free the 40313 Preserving Newspapers Booklet, one leaflet per order. Ships promptly! 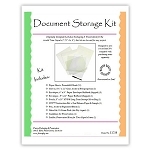 Perfect small preservation kit for documents! Ships promptly. Designed for the 6x24" Time Capsule, this kit is great for any family sized project. Ships promptly! Designed for the 5x22" time capsule, this kit works for family sized projects.